We found ourselves feeling Grinchy already, even with Christmas still several weeks away. The perfect antidote to the holiday doldrums is the box of goodness that is Daisy’s monthly delivery of Super Chewer toys and treats. 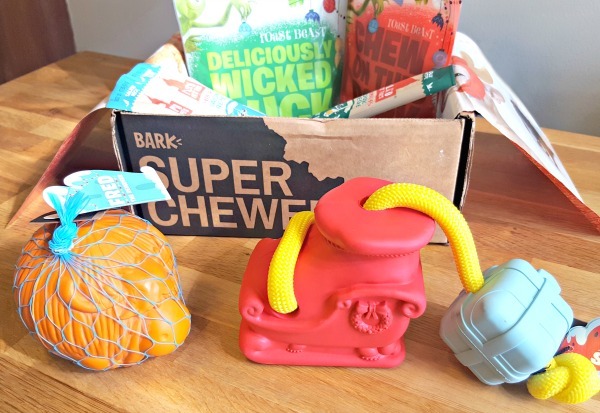 In case you hadn’t already heard of it, Super Chewer is a dog box subscription service designed especially for dogs who are toy destroyers and extreme chewers. 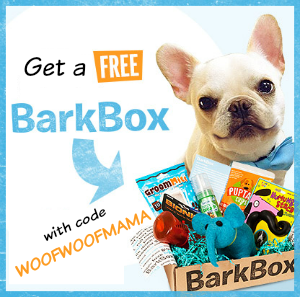 It’s a monthly delivery of the most durable dog toys and extra long-lasting treats, customized for your dog’s size and food allergies. 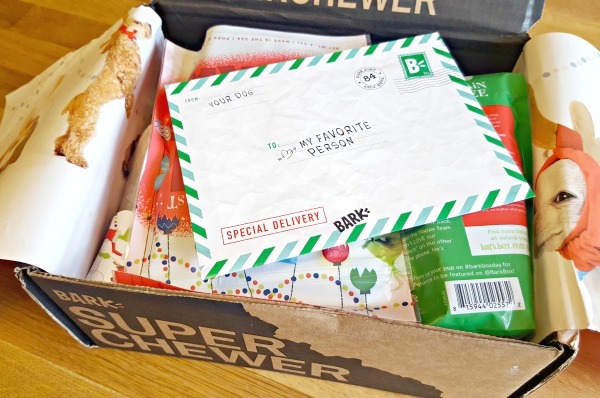 Every month’s Super Chewer Box has a different theme, and this month’s theme is The Grinch. 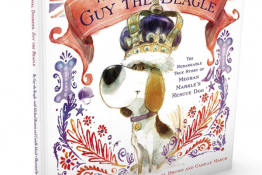 It’s a special limited-edition box that’s still available as of this writing, so I’ll keep things brief so you can get right to it if you want to snag one for your dog! Fred the Reindeer Dog Toy ($14 retail value) A super tough and durable squeaky toy made of natural rubber. For outdoor play, the bright orange would make it easy to see in the snow…or in our case, the sand. Daisy ran off with this one as soon as I unwrapped it, but I’ll try to take a photo later of how CUTE it is! Grinch’s Sleigh Dog Toy ($14 retail value) Also made of natural rubber and super strong, with a durable nylon rope for tug and a squeaker in the body of the sleigh. I’m actually saving this one as a stocking stuffer for Daisy on Christmas eve. Roast Beast Deliciously Wicked Duck Dog Treats ($8 retail value) Duck is one of Daisy’s favorites, and I LOVE the Grinchy treat bag! As with all Bark dog treats, these are made in the USA with natural ingredients, free from soy, wheat and other stuff dogs shouldn’t have. 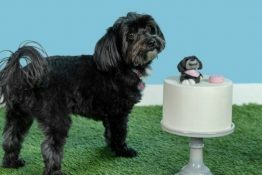 You can customize your dog’s plan based on any food allergies, which is just one of the many things we love about having this subscription. Roast Beast Chew On This Pork Dog Treats ($8 retail value) These have pork as the protein and flavor. Who could argue with that? Not Daisy! She loves bacon, ham, basically anything with pork, but we don’t let her eat too much people food so these are the perfect holiday treat for her instead. Plato Pet Treats Thinkers Salmon Dog Chew Stick X 2 ($6 retail value) There are always full-size meat chews in every month’s Super Chewer box, and Plato makes some of our favorites. This time it’s a double batch of their salmon treat sticks, yay! Called Thinkers because this dog snack is packed full of DHA and Omega-3 fatty acid famous for its cognitive benefits. 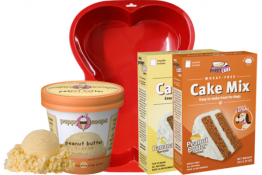 This treat is true brain food. Plato Pet Treats Duck Stick ($3 retail value) Another of our favorite treats from one of our favorite brands. 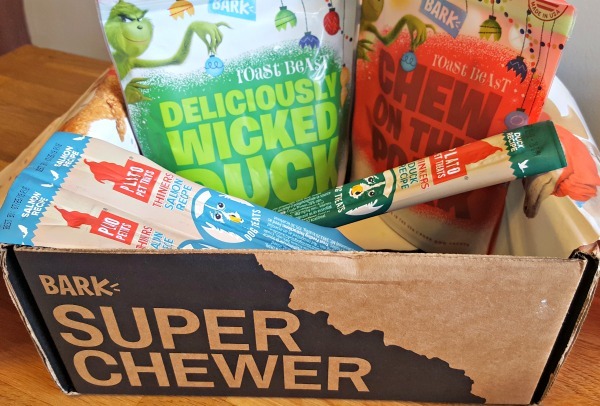 Although we like surprises, we never tire of getting these in our Super Chewer box. 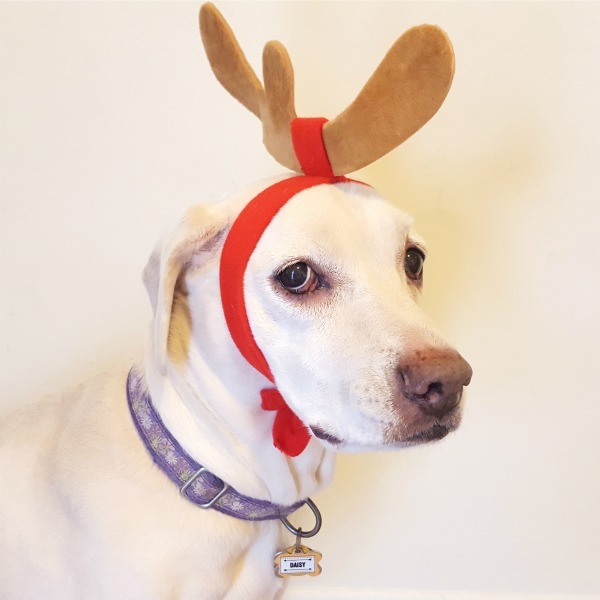 Daisy is feeling pretty Grinchy having to model the special Max Antlers that were included in this month’s Super Chewer box. We always LOVE the little extra surprises and bonus items that their folks dream up for each month’s theme. This one is the perfect photo prop for Instagram, and making some Grinch edition photo cards for Christmas if I can find the time. The Grinch box is still available and there’s a special offer if you hurry and order here soon! Subscribe and your first box is a DOUBLE-SIZED limited edition Grinch box. 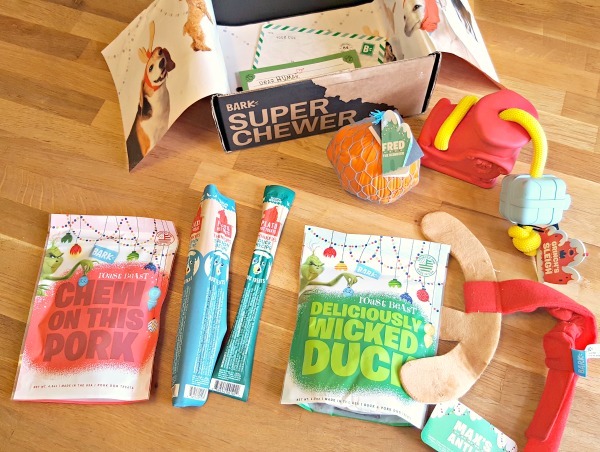 DOUBLE your box and double your fun with FOUR Grinchy toys, FOUR full-size bags of treats, and FOUR tasty meat chews. Shipping is FREE so there’s no reason to be a stingy Grinch. 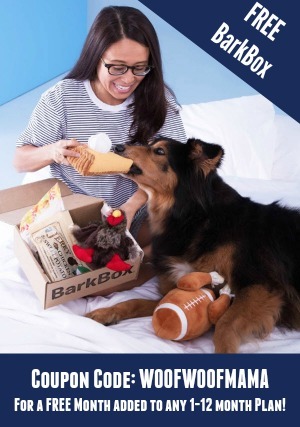 Head on over using this link and snag a box to put under the tree this year for your fur kid! My son finally received the Super Chewer November box last week and Stark and Champion destroyed the sleigh toy I. No time. They chewed through the rope and the rest of the toy had to be thrown away. Just contact their customer service and let them know. Every box comes with a guarantee, and they will send you free replacement toys!